Kenya, Zimbabwe, Other African Nations Hold Lessons For Venezuela Based in Nairobi, Kenya, Eyder Peralta usually covers Africa for NPR. After reporting recently in Venezuela, he describes parallels he saw with popular movements facing government repression. 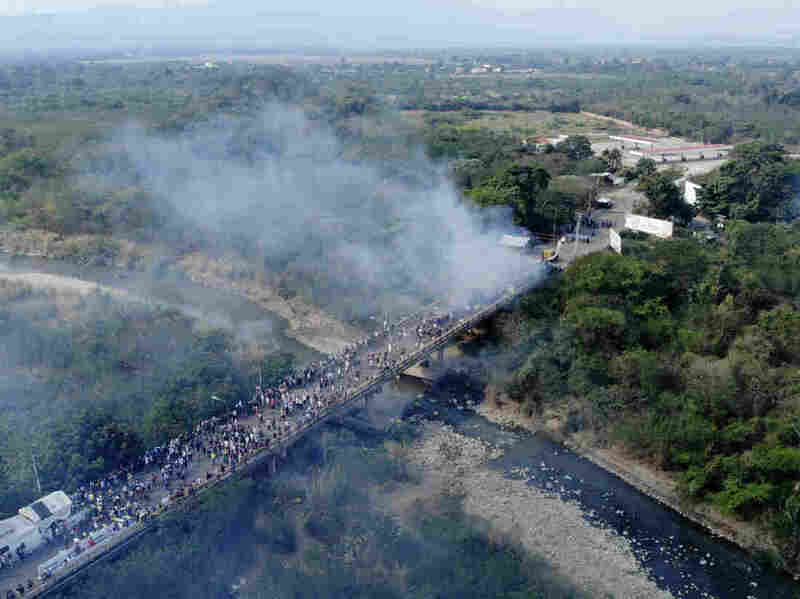 Smoke billows from aid trucks set on fire on the Francisco de Paula Santander International Bridge between Colombia and Venezuela, on Feb. 23. In the morning of Feb. 23, many Venezuelans were hopeful that opposition leader Juan Guaidó would lead a convoy of humanitarian aid into Venezuela from Colombia. Venezuela's military was ordered to block the convoy from entering, so citizens surrounded military barracks to plead with soldiers to join the opposition. They hoped the 20-year socialist regime would be forced into submission by the sheer weight of popular will. But as the day wore on, one of the aid trucks that tried to make it past the Venezuelan military was set afire. In Caracas, where tens of thousands had surrounded a military airfield, the pleas with the military became more desperate. "We are your children!" "You are hungry, too!" "Choose the right side of history." The soldiers took pictures and gave the crowds the middle finger. Then the colectivos — a paramilitary group, in black helmets and black jackets — showed up in support of the government of President Nicolás Maduro, revving their motorcycles, flashing their guns. What was left of the crowd ran. Mayling Keisling hid behind a concrete wall. She begged a friend not to go out into the open to face off the with armed bikers. "How many more have to die, before someone helps?" she shouted into the air. "We are forsaken. We are alone. Guaidó no longer knows what to do. What are we supposed to do?" Based out of Nairobi, Kenya, I usually cover Africa for NPR. But as this story grew, NPR needed reinforcements in Venezuela, so I went. That day in Caracas, I could not help but think of the parallels. In Africa, I have seen popular movements rise, take shape and build to inflection points, where the course of a country's history could be easily swayed. That Saturday felt like that kind of moment in Venezuela. Guaidó had incredible momentum. He had a broad international coalition recognizing him as the country's rightful president. He had hundreds of thousands of supporters on the streets and a plan to bring in humanitarian aid that also served as a perfect counterpoint to the failures of President Maduro. The question was could the opposition execute? Could they take this historic opportunity and really injure the Maduro government? It reminded me of a moment in January 2018 in Kenya. Tens of thousands of people gathered at Uhuru Park in Nairobi as opposition leader Raila Odinga promised to defy the official election results and the government by declaring himself president. Kenya was months into a standoff between Odinga and President Uhuru Kenyatta. The country had held two elections. The first was thrown out by the country's Supreme Court, the second was boycotted by Odinga. Some opposition strongholds were so beset by violence the second time that polls never opened. At least 100 opposition supporters were reported killed by police and pro-government groups, with some estimates even higher. By the time Odinga announced his intent to "inaugurate" himself as president, the government had had enough. It felt a lot like Venezuela: two men claiming the presidency in a high-stakes jostle for power. But unlike Guaidó, who has been recognized as the legitimate leader of Venezuela by more than 50 countries including the United States, the U.S. had warned Odinga against taking the oath of office. Kenya's government had promised a violent crackdown and that it would charge Odinga with treason, which is punishable by death, if he went through with his plans. Just as Venezuela's security agents have come out in force, the streets of Nairobi were militarized in advance of the opposition event in the park. Paramilitary police, armored vehicles and water cannons were stationed at nearly every corner. Yet every inch of Uhuru Park was packed with Kenyans willing to face off with security forces. Everyone I spoke to wanted Odinga to declare himself president, and after that, they wanted to march with him to the presidential palace and take it by force. The security forces retreated. They didn't fire tear gas, they didn't shoot or beat anyone as they had in the past. And at that moment, it became clear that Odinga had won over the majority of Kenyans. Similarly, in Venezuela, the opposition mobilized a sea of people to the streets of Caracas saying "somos mayoría" — we are the majority. Odinga arrived at that park to deafening applause. He quickly took the oath of office and, then, without any explanation, told everyone to go home. Odinga's running mate and other opposition members did not show up to the ceremony, where they risked being arrested or seeing a bloodbath. Months later, in a surprise move in March, Odinga shook hands with President Kenyatta, pledging to work with him toward reconciliation, and has stopped talking about a rebellion. In Zimbabwe, a similar opportunity to depose a longtime government dissipated just as easily. It was Aug. 1, 2018. The opposition had just competed in Zimbabwe's freest elections since the country ended minority white rule and became Zimbabwe in 1980. It was also the first election without Robert Mugabe on ballot. So, it was without a doubt the chance of a lifetime to oust the ZANU-PF party that had ruled Zimbabwe for almost four decades. But as the votes came in, observers noted vast irregularities and it became clear that Emmerson Mnangagwa, once Mugabe's deputy and now the head of ZANU-PF, would soon be declared the winner. The opposition took the streets. It was a show of force meant to nudge the electoral commission into counting the votes fairly. But within minutes, the military opened fire. It was one of the most remarkable turnarounds that I have ever witnessed — a country filled with hope that democracy would finally prevail, returned in an instant to the grips of authoritarianism. The government ordered the arrest of opposition figures and security officers conducted door-to-door operations, beating and torturing anyone seen as supporting the opposition. The rebelliousness that many had expressed openly — even in Mugabe's home town — turned into bitter resignation. One thing I've learned on the continent is to be ready for surprises. Ethiopia is one country that recently had a stunning outcome, which may even hold lessons for Venezuela. In 2018, after two years of street protests across Ethiopia, one of the most authoritarian regimes in the world began to crumble. The protest movement had made the country ungovernable. After lengthy general strikes, the opposition gave the government a way out. Opposition leaders offered the embattled administration a chance to replace its leader with Abiy Ahmed, a reformist from the ruling party. Since being sworn in in April 2018, Abiy has thrust Ethiopia into a new, more democratic era. Guaidó left the border showdown last month with little. Most of the aid remained in Colombia and, after subsequent meetings with regional leaders and Vice President Mike Pence, the U.S. placed more economic sanctions on Venezuelan officials and their associates. On Monday, Guaidó flew back to Caracas, arriving to smaller crowds than he is used to. In a way, like Ethiopia's opposition did, Venezuela's opposition leader offered a major concession — an amnesty for armed service members who turn against Maduro. Ultimately, few security agents have defected to Guaidó's side. And, while some protesters did face off with the Venezuelan military, Guaidó made a decision not to use his people power to push further — to make the military decide whether they will shoot unarmed civilians to keep Maduro in power. The vision he had put forward was a mass of people moving from both sides of the border and peacefully forcing the military to move out of the way. That never happened and the march on the Venezuelan side never even materialized, crushed, perhaps, by the paramilitary colectivos. On the streets in the days that followed, I heard one common refrain: No one in Venezuela wants to be responsible for bloodshed. So as has happened in the past when once-beloved opposition leaders called their supporters off the streets, the government carries on. Guaidó says this fight is not over. But that's the same thing Odinga said in Kenya and opposition leader Nelson Chamisa said in Zimbabwe. And for a few weeks after those pivotal moments, things simmered and hope lingered. It feels that way in Venezuela, where a huge protest is planned for the weekend. But following those two key days in Kenya and in Zimbabwe, it slowly became clear that their governments weren't going anywhere and that a generational opportunity for change had dissipated.